his/her particulars, a User ID is generated and sent to his/her registered mobile number and email ID. Applicants need to apply for the Tests using the OTPR User ID through Commission’swebsite. 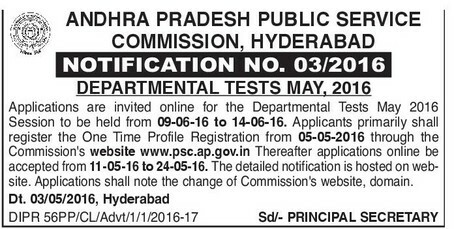 The last date for submission of online application is 24.05.2016 upto 5PM and thepayment of fees shall be accepted till 11:55 PM of 24.05.2016.
b) The applicant shall pay Rs. 500/­(Rupees Five Hundred Only) towards application. i)Failure to upload the Photo/ Signature. ii)Failure to pay fee towards the Test and application. applicant and the Controlling Officer with seal. iv)If the filled in Application Form is not in terms of this notification. vi)If the candidate applies during debarment period. For any Technical problems related to Online submission. No Comment to " DEPARTMENTAL TEST - NOTIFICATION "